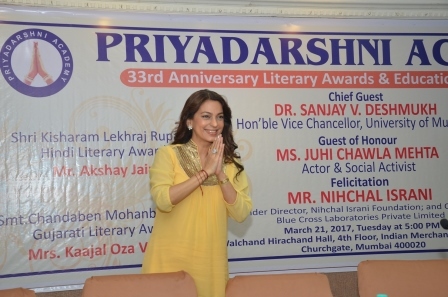 The event, which was jam-packed, saw the Hon’ble Vice Chancellor, University of Mumbai, Dr. Sanjay Deshmukh serving as the Chief Guest while Bollywood Actor, Entrepreneur and noted philanthropist; Juhi Chawla Mehta was the Guest of Honor. 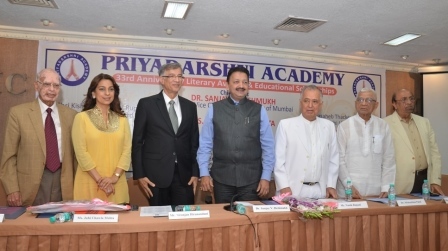 Real Estate Mogul, Mr. Niranjan Hiranandani who is the Chairman at the Priyadarshni Academy, gave the welcome address, which was followed by the Chairman Emeritus, Mr. Nanik Rupani’s speech. The Academy presented 380 scholarships to deserving and financially needy students pursuing different fields of study were also presented. Literary awards for work in the Hindi, Sindhi and Gujarati languages were presented to Mr. Akshay Jain, Prof. (Mrs.) Meena Gope Rupchandani and Mrs. Kaajal Oza Vaidya respectively for their outstanding contributions to the writings and teaching in these languages. Each award carried a purse of Rs.25,000 and a handsome plaque. The Academy also felicitated Mr. Nihchal Israni, Founder Director, Nihchal Israni Foundation; and Chairman, Blue Cross Laboratories Private Limited; for his significant contributions to Education and Healthcare.